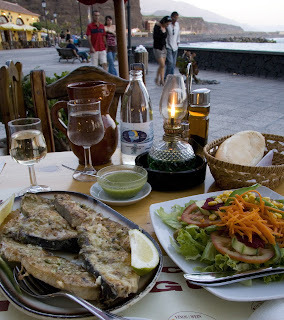 If the island of La Palma is one of Europe's best kept secrets, then Tazacorte is probably a secret even better kept. Although it is the smallest municipality on the island at only 12km², it still manages to include most of the elements that any holiday-maker could ever wish for - beaches, walks, shops, culture and last but far from least some mighty fine restaurants! Oh, and some great holiday apartments to rent too. 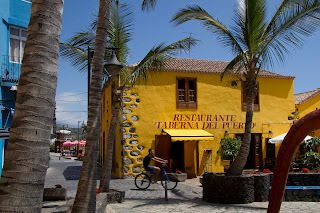 The following is an abridged version of our own 6-page guide to Tazacorte which we include with all bookings for Tazacorte made with us here at Holiday La Palma. 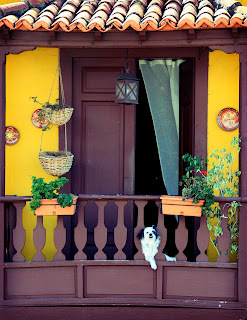 But we didn't want to leave you out so please do enjoy the read and photos! How did Tazacorte get its name? On the 29th September, 1492, Adelantado Fernandez de Lugo and his troops (the Spanish Conquistadors) arrived on the beach at Tazacorte to invade and conquer the island of La Palma. The king of Tazacorte, Tazo, died heroically trying to defend his people and his lands and ever since, the area has been called the Corte del Rey Tazo, the cutting down of King Tazo, in other words - Tazacorte. 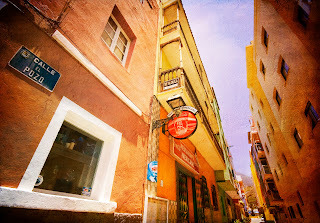 Where and what is Tazacorte? 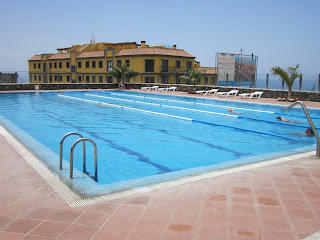 Tazacorte is one of only three beach resorts on La Palma with Puerto Naos and Los Cancajos being the other two. 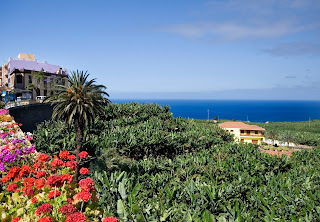 Tazacorte lies by the coast in the west of La Palma and along with Puerto Naos is one of the sunniest places on La Palma - in fact, many say that it is the sunniest place in the whole of Europe. 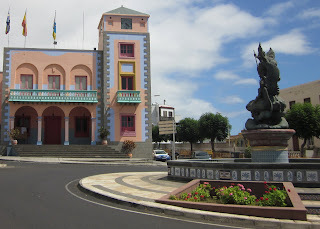 To the north of Tazacorte is the municipality of Tijarafe and to the east and south is Los Llanos. To the west is the mighty Atlantic - next stop America! So how does this little place pack such a punch? Well, it helps that it is divided into two very different (but close) parts, namely the town (El Pueblo de Tazacorte) and the port (El Puerto de Tazacorte). The Puerto de Tazacorte is further divided into two parts, the marina and a small beach resort. The town of Tazacorte lies approximately 1.5km inland from the Puerto de Tazacorte and is a fabulous mix of old and new which really appear to seamlessly blend together. It seems to be no surprise at all that a tousled mass of narrow streets from the old quarter should descend to the historic church and Hiper Dino supermarket, Disney-esq Town Hall (although at the moment painted white again) and a central roundabout which, despite the relatively few cars, seems to divert an accident only by a minor miracle. The centre is built around a statue of St Michael the Archangel, the patron saint of Tazacorte, and this is where the new plaza with an outdoor café and columns decorated in mosaics is located. It’s the new ‘place to be!’ A trip into the old quarter is also an absolute must in my book. The beach resort of Tazacorte and the marina are approximately 500m from each other with a broad and flat esplanade linking the two which makes it perfect for a daytime or evening stroll. The little beach resort itself is made up of a leafy boulevard with a few street cafes and where a selection of excellent self-catering holiday apartments are located. 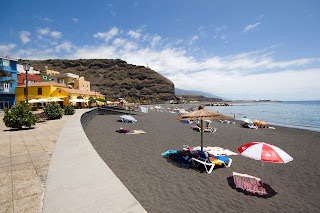 A few moments away is the sandy beach which is a real haven for swimming, snorkelling and relaxing on the black sand which retains its heat even on a cooler day. (Handy tip: if you have small children, make sure they stay near the breakwater end as there can sometimes be sudden large waves). Along the promenade and overlooking the beach are a group of excellent open-air restaurants which are popular with tourists enjoying a long and lazy lunch and with business-people alike. The speciality is of course fresh fish but the salads, goat's cheese, papas arrugados (wrinkly potatoes) are also something to write home about. Not forgetting the excellent La Palma wine. Close by you will also find a small selection of shops which include a mini-market, chemist, beachwear shop, gift shop, ice-cream shop and a couple of café/bars. Although not a large resort by any means, it is possible to arrive at the beach resort and never leave for the entire week of your holiday! Check out the Tazacorte apartments here. The harbour/marina of Tazacorte is at the opposite end of the promenade to the self-catering holiday apartments at Tazacorte. Near the marina is a pizza restaurant plus two excellent bar/restaurants within the marina. 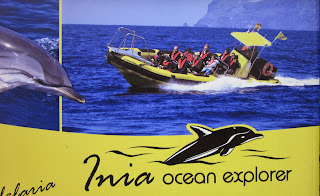 Apart from shiny yachts and colourful fishing boats, there are various boats which offer daily dolphin spotting and whale watching trips including the Fancy II, Flipper Whale Watching, Fantasy, Bussard, Mojo Picon sailing yacht and the Inia RIB (Rigid Hull Inflatable). Full information on these boat trips (prices, duration, type of trip) is included in your Guide to Tazacorte which we email you on booking with Holiday la Palma. You can book any of these boat trips directly with us. Sea / sport fishing is available with La Palma Atlantic Experience. Tazacorte is a great base for walking too as this is where the GR131 El Baston begins/ends and the GR130 Camino Real trekking trail is just 1km away. It is a great location for the Caldera de Taburiente, La Cumbrecita and the Volcano Route. When you book with Holiday La Palma, we provide you with walking notes for some of the main walks in the area such as the Caldera de Taburiente, Volcano route, La Cumbrecita and the GR130 Camino Real.